The big weekend for Boca Bargains has arrived! To showcase furniture donated over the summer, the opening will include a tent sale on the grounds of the Community Center, adjacent to the Boca Bargains building. There will be additional furniture and decorative items for sale in the newly refurbished annex, and the main store area will feature clothing, knick-knacks and gently used toys. For those who are in the holiday spirit, you won’t want to miss the festive Christmas boutique. Serious shoppers should arrive when the doors open at 9 a.m. on the 25th and plan to shop until Boca Bargains closes at noon. You may have noticed the interesting window display already in place at the Boca Bargains storefront featuring Alice in Wonderland. 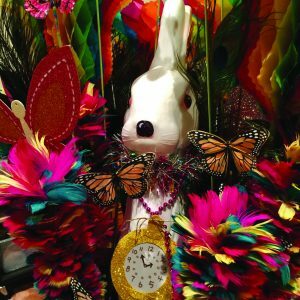 It was created by Susan Bowers, who said she started with the whole “welcome to Wonderland” theme because of the store’s new look. 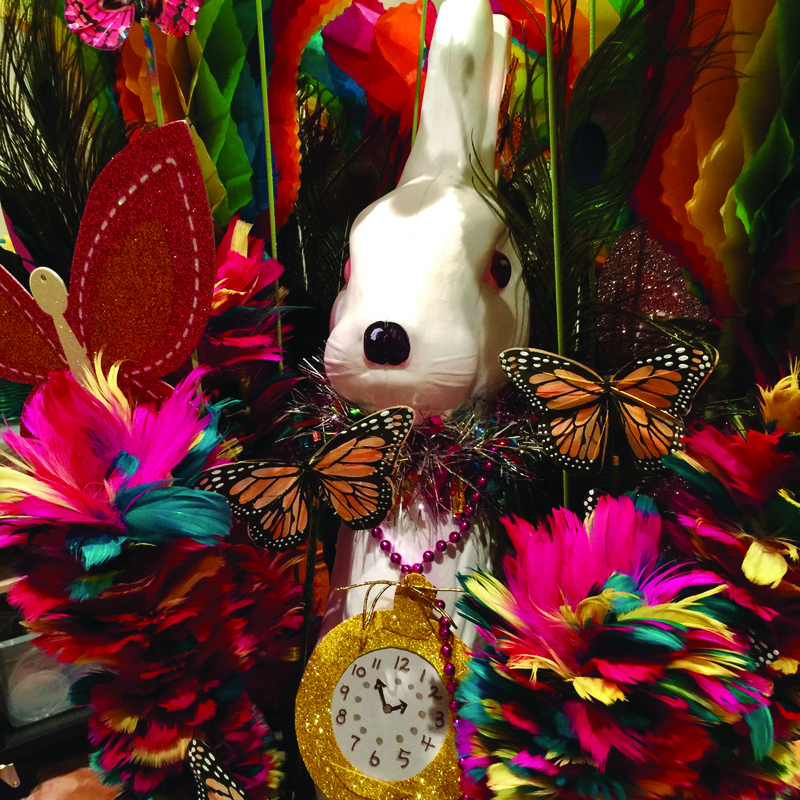 A big white bunny is the main focal point, a rare treasure that Susan found at the Suncoast Thrift Store. 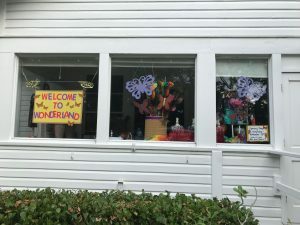 She added a few brilliantly colored feather dusters that appear to date back to the 1940s, a few other odds and ends, and the Wonderland theme was born. Established in 1986, Boca Bargains is celebrating its 31st year and has become an island fixture, staffed by volunteers from the Woman’s Club throughout the season. After the opening sale, the store will be open on Mondays, Wednesdays, and Saturdays from 9 a.m. to noon until April, 2018. Please, no donations accepted on opening day. Donations are welcome between 9 and 11 a.m. on Mondays, Wednesdays, and Saturdays beginning November 27.